Much like beleaguered survivors in the stories featuring them, I think we'll have to accept that zombies are now just a fact of life. After a bit of a lull in the 80s and 90s, the interest and fascination with zombies has been... with apologies... reanimated thanks to an influx of quality zombie flicks such as 28 Days Later (yes, I know they're technically infected humans in that one), the Dawn of the Dead remake and Shaun of the Dead, as well their presence in comics such the Walking Dead and television through the AMC adaptation of the same. Nowadays, you can find a zombified version of practically every pop culture character imaginable and most of my friends have quietly developed their own strategy for surviving the zombie apocalypse. One person who's thought about that possibility more than most would be Max Brooks. The son of comedic legend Mel Brooks, he's also the author of The Zombie Survival Guide, a mock how-to manual for dealing with the dead that could have sprung from the world he depicts in his other bestseller, World War Z. That book is structured as a collection of testimonies pertaining to the great worldwide zombie outbreak and offers ridiculously detailed scenarios of the political, social, religious and scientific ramifications of such an event as witnessed by disparate survivors across the globe. Being a success and with zombies so popular, it was inevitable someone would pick up the film rights, in this case Brad Pitt's production company Plan B Entertainment. There was excitement about the possibilities. I had hoped the filmmakers would preserve Brooks' faux-journalistic style, possibly as a mock documentary. 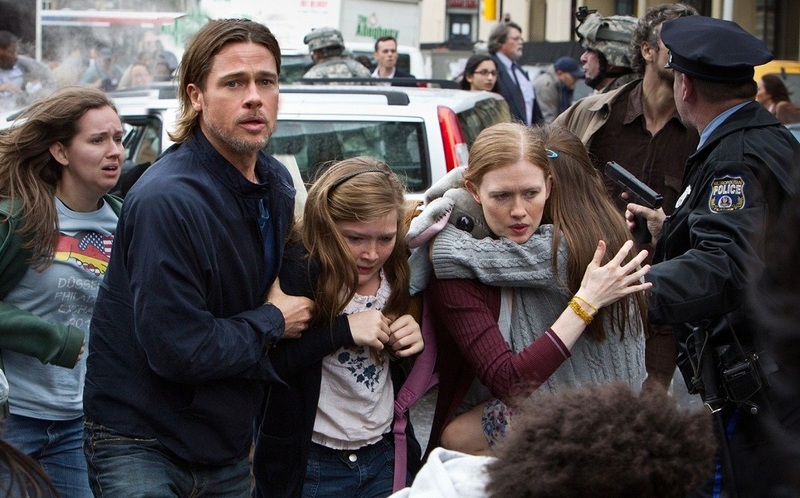 But it quickly became apparent that as a film, World War Z would be a very different beast. The multi-character structure of the book was tossed out to focus on former UN investigator Gerry Lane (Pitt), who barely escapes Philadelphia with his family after the outbreak begins. Tasked with tracking down the source of the pandemic in the hopes that tracing the virus might aid the development of a cure, Gerry embarks on a globe-hopping tour of zombie devastation, hunting for any advantage that might allow humanity to survive. The positive buzz about the project quickly hits some snags after it was understood how little of the book survived the adaptation process and the situation wasn't helped by rumors of postproduction turmoil and a totally reshot ending. There was also the disturbing revelation the movie would be PG-13; how could anyone depict the requisite carnage of a zombie apocalypse under such a restriction? Then there was the curious way the word 'zombie' was so absent from the marketing. But divorced from expectations of the original novel, I'm surprised to find that this mutated form of the concept manages to be an effective, if somewhat muted, thriller in its own right, mainly by offering something the zombie genre has never really enjoyed to this degree: scale. 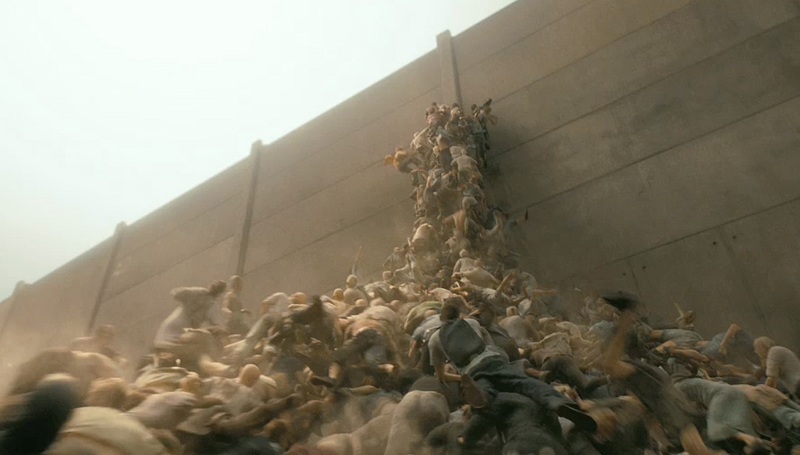 The high-budget has allowed the kind of expansive scenes of the dead overrunning cities en masse and chasing down fleeing people that we've always imagined but have never been able to see. While previous movies have given us zombies that shuffle like drunkards or snarl like animals, here the mass of dead are depicted as a surging, flailing mass, smashing through or over barriers and pouring through streets and alleys like a swarm of insects operating under some group instinct. They succeed in being terrifying in their chaotic frenzy, particularly when attacking in enclosed spaces. Like the most effective screen monsters, you don't want to be anywhere near them. Of course, the wide scope of the film comes at a cost, both financially and dramatically; the high budget commands that the filmmakers make the film accessible to the widest audience possible, which makes the PG-13 rating necessary. As a result, many requisite elements of zombie lore, such as the customary flesh-eating, are abandoned and we see very few of the gunshots to the head that are the recognized method of dispatching the dead. In fact we see so little of that for a good portion of the story, I wasn't sure if that was still the case here. It takes quite a while before it's confirmed what we're seeing are zombies, making the first third of the film feel like an unofficial prequel to 28 Days Later that shows what went down while Cillian Murphy slept in his hospital bed. The movie avoids the siege or survival structure of most zombie flicks and adopts the traits of an infection thriller. Indeed, with so much of the movie focusing on the authorities investigating the viral nature of the crisis and Pitt's character following rumors of a possible patient zero, it often feels more like some alternate version of Outbreak or Contagion that angry zombies have sprinted their way into. The virologist (Elyes Gabel) who accompanies Gerry on his mission has a nice speech personifying a virus as a serial killer who can't help but leave clues to its identity and weaknesses, causing us to view the hallmarks of zombie behavior in the context of symptoms. However, to some degree the screenplay processes this investigative aspect into something resembling the levels of a video game, with each sequence revealing a goal that Gerry must achieve to proceed to the next and so forth. One more unique aspect of the story is its portrayal of the surviving humans. Usually as society breaks down we get a cynical portrait of the darker, more primal side of human nature in these stories, to the point where our fellow humans often prove more dangerous than the zombies. Here there's a steady theme of people coming together. It starts in tiny ways; as Gerry and his family get into a fender bender while stuck in a traffic jam, a nearby cabbie checks to make sure they're ok. It's a tiny human moment that most movies wouldn't bother with. As the film goes on, those touches grow in scale, from a low-income family giving Pitt and his loved ones shelter and food to a group of humans silently working together to build a makeshift barricade against a nearby herd of the dead to the Israeli government giving shelter to Palestinian refugees. The focus is on people helping each other out to survive and it's a rewarding change. Director Marc Forster mostly abandons the shaky, hyper-cut Paul Greengrass-inspired action style he utilized for his Bond film Quantum of Solace, emphasizing the chaos as an element of the situation rather than as a part of the cinematography. He also proves adept at staging effective shock scares and crafting some really good suspense, particularly in the third act as several characters must stealthily navigate a building filled with zombies, staying as silent as possible so as not to alert them. As our central figure, Pitt demonstrates that he's fully invested in the project even if there's not a lot of dramatic heft to the role. He almost seems to be playing a modern update of the scientist-hero common in 1950s sci-fi movies, bursting into each situation as the most important guy in the room to the point that he can have planes rerouted, command troops and gets top priority when it comes to evacuation. We might grow a bit resentful of this level of privilege but the way Gerry's skills at observing little details and utilizing the knowledge he's gained are integrated into the story make it a bit more believable that he'd be regarded as such a valuable figure in the field. We get a nice eclectic mix of familiar character actors and new faces among the people Gerry encounters in his travels. Mireille Enos is fine as Gerry's wife even if she gets little to do in the second act but wait worried by the phone for a call from him. The most impressive supporting performance has to be Daniella Kertesz as a steely Israeli commando assigned to protect him during a visit to Jerusalem. We also get nice appearances by David Morse, the very busy James Badge Dale, Peter Capaldi, and a blink-and-you'll miss it appearance by Matthew Fox, whose role was drastically reduced after reshoots. More on that in the SPOILER entry. 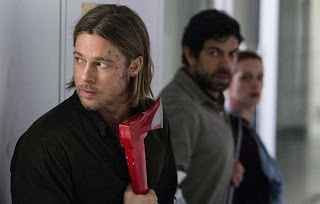 While there's no denying the film has to pull itself back from the stark horrors and brutality of its source material, World War Z does effectively offer scares on a broader canvas than any other zombie movie has been given to play with. It can't replace the apocalyptic fun of George Romero's zombie films or match the long-form dramatics of Walking Dead but makes for a decently creepy travelogue of pop culture's most compelling and gruesomely entertaining disaster scenario. 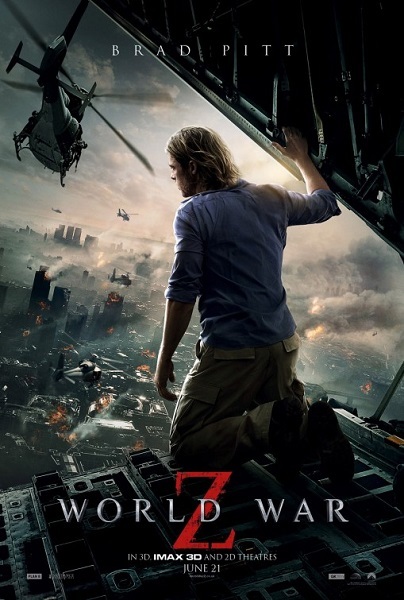 WWZ is like ordering a Double Whopper With Cheese and getting a veggie burger instead. Although the veggie burger was well made, and as far as veggie burgers go it tasted pretty good, still, I came for the Double Whopper with cheese. As far as fast moving Zombies go, Simon Pegg says it much more eloquently than I can. "The speedy zombie seems implausible to me, even within the fantastic realm it inhabits. A biological agent, I’ll buy. Some sort of super-virus? Sure, why not. But death? Death is a disability, not a superpower. It’s hard to run with a cold, let alone the most debilitating malady of them all. Another thing: speed simplifies the zombie, clarifying the threat and reducing any response to an emotional reflex. It’s the difference between someone shouting “Boo!” and hearing the sound of the floorboards creaking in an upstairs room: a quick thrill at the expense of a more profound sense of dread. The absence of rage or aggression in slow zombies makes them oddly sympathetic, a detail that enabled Romero to project depth on to their blankness, to create tragic anti-heroes; his were figures to be pitied, empathised with, even rooted for. The moment they appear angry or petulant, the second they emit furious velociraptor screeches (as opposed to the correct mournful moans of longing), they cease to possess any ambiguity. They are simply mean." While I understand where Pegg's coming from, I think a lot of it depends on context. In the case of this film, where the zombies feel like a stand-in for infection, I think their speed works in suggesting the insidious rapidity with which a pathogen can spread. There's also no denying that Romero neutered the threat of slow-moving zombies to some degree with his screenplay for the Night of the Living Dead remake. When you have a character remarking how easy it is to walk right by them, it becomes harder to imbue them with the level of visceral menace that some filmmakers prefer. And I did somewhat like Zack Snyder's explanation for sprinting zombies in the commentary for his Dawn of the Dead remake. He reasoned that a creature that can feel no pain and does not tire could push itself beyond normal human levels of endurance. I was surprised by how much I liked Snyder's remake. I used to work in the dietary dept of a nursing home. When it came close to meal time you needed to get out of the hallways and out the dining area or risk getting swarmed and blocked off by seniors. It reminded me of Zombies. It would start of with one or two shuffling along with their canes and walkers and then all of the sudden you were swarmed. Seniors out of seemingly nowhere, all around you just shuffling along and you were blocked off. It was deceptive how fast the area filled and they were on top of you. That deceptiveness is one aspect that I find most frightening about the slow moving Zombie. As for WWZ. I understand why they did it the way they did. The book to me is special and unique. I was just hoping they would it would be the same with the movie. Instead I found it to be kinda ordinary. I will say the disease center part was done really well. That was the only time the film really grabbed me.